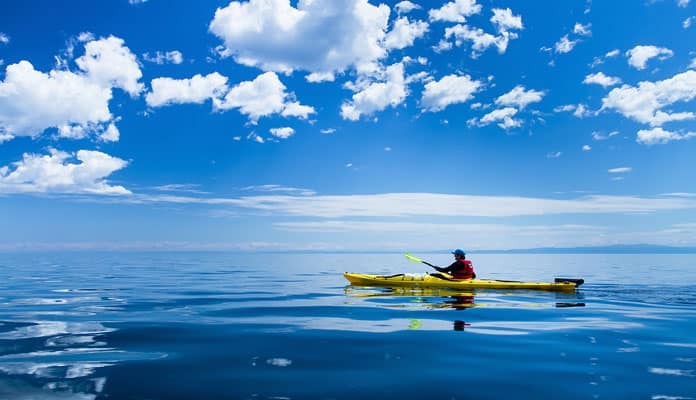 Kayaking can be a wonderful experience but getting the kayak to the water can be an exhausting experience. They are difficult to carry and that can lead some people to not even bother doing an activity that they love. This is where the best folding kayaks can be brilliant. In order to get the best portable kayak, there are many things to consider. The ease of assembly is going to be important, as are the durability, storage and weight. There are other features to consider too which can make the whole process confusing. In this guide, we will simplify that decision for you by giving you all the information you need. We have also completed folding kayak reviews to show you the best products on the market. Once you’ve read through this guide, you’ll be able to choose the perfect folding kayak for you. This is an impressive kayak that has a very large folded out size of 10 feet but will fold down to a very compact and easy to carry shape. It has a quick assembly without any loss of durability as this is a kayak that will last for a very long time. It is able to perform very well and it is able to glide across the surface and with a good level of agility. There are a few different colors available which all look great. Overall this is a brilliant folding kayak and will give you endless hours of fun on the water. This canoe can be unfolded and assembled in under ten minutes, and you can get it folded up ready for transport in under 5. This is one of the highest-quality folding canoes in the world, and well worth the price tag. When unfolded, you have a beautiful Canadian canoe, and you will wonder how they manage to have such great quality and still have it fold up so small. With two seats and enough room to comfortably house two people, this canoe is great for couples to take out on the water. When you have folded it up, it is small enough to fit into almost any small car. Once you have it on the water, the speed is great, the maneuverability is stunning, and the design is amazing. The second entry from Oru. With the Bay St kayak, they have updated the folding mechanics from previous versions. The kayak is now easier to fold and assemble than ever. Previous models used ratchet buckles. This version has an easy to use seam cover which slips over the middle seam to create a more waterproof seal. Along with being easier to set up, the newer model also has more room in the cockpit. This offers more comfort as you are paddling through the water. The durable outer shell is still made from high-quality polypropylene and can be folded up to 20,000 times before anything starts to go wrong. The UV treatment helps the shell to last longer, and the 1.5-inch bow rocker creates a more sporty and speedy paddling experience. We could talk a lot about the folding mechanism and ease of use of this kayak, but what really sets this kayak apart are the included extras. The kayak comes with a free paddle, which means you do not have to source one which is the perfect size. It also comes with a life vest. This is an item which is so often forgotten about. It is nice to have one included for free. There is also a comfortable seat, a cup holder, a camera mount, and a storage bag. We are particularly happy about the cup holder. This is also an easy kayak to transport. It only weighs 30 pounds, and the storage bag makes it a breeze to get from your vehicle to the water. 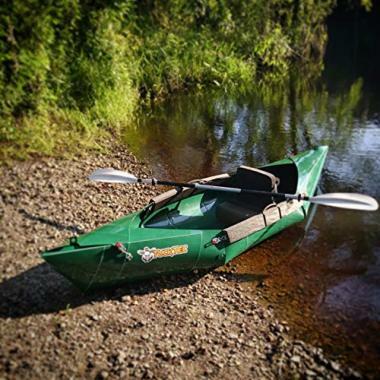 When you do get to the water, you do not need any special tools to assemble to kayak and can have it assembled in less than ten minutes. This is one of the fastest kayaks out there. The shape of the kayak, and the weight distribution makes this kayak sporty and fleet. You will find yourself traveling through the water quickly, and you will be able to turn sharply too. 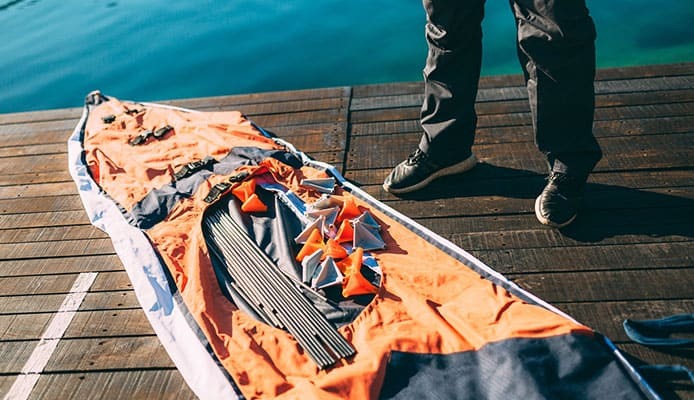 This accessory kit is designed by Folbot and has been created to complement their Folbot foldable kayaks, but the kit will fit with other foldable kayak brands too. The accessory kit is easy to install. Simply place it over your kayak and attach with the included fasteners. The foot rudder easily attaches at the stern, and you can easily use the foot controls to manipulate it. In shallow water, it will retract to prevent damage. The full deck can be placed over your kayak to fully protect it from the water. The full deck is made from marine quality materials and attaches simply with velcro to keep all of your kayak accessories dry. Also included is a wilderness repair kit, which has everything you need to patch and repair your kayak, should anything go wrong with it. There is also extra padding for the keel frame, which will protect your hull. 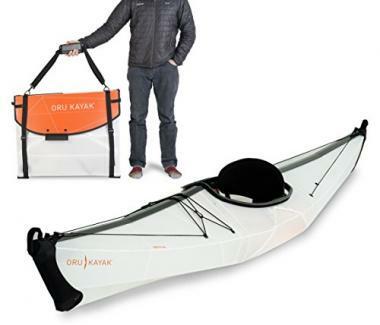 If you are spending a lot of money on a foldable kayak, then this kit can extend the life and protect you from any problems which may arise. What exactly do you need to know before you buy a folding kayak? Well, as the kayak is foldable, one of your main concerns is how easy it is to unfold and assemble. You may find the cheapest kayak on the market, and it may handle well in the water, but if it is a nightmare to assemble, you may as well not have it. I mean, that is why you bought it, right? You should also be looking at the storage. If it folds, it should store well. The materials used in the construction are also important. You want a kayak which will last through folding and unfolding, as well as last in the water. The beam of the kayak is something which every kayaker should consider. Your skill level when it comes to kayaking will determine which beam is better for you. A longer beam, something around 30+ inches, will be better for beginners learning to kayak. A longer beam means more stability in the water. For a new kayaker, you want to be getting to grips with being in the water and paddling through the water, without having to worry about your kayak tipping. If you have some experience kayaking, then you might want to go for something shorter to give you more maneuverability in the water. If you aim for a beam around 25 inches, you will still get the stability you need as an experienced rider, but will also have the handling capabilities and sporty feel which you need. This could be one of the most important aspects of your folding kayak. If your folding kayak does not fold and assemble easily, then you may as well buy a traditional kayak. When you get to the water, you want to be able to assemble your kayak with the minimum of trouble. You do not want to be going back and forth to your vehicle to retrieve kayak parts or tools. The fewer pieces your kayak comes in, the easier it will be to transport to the water and to assemble. You should also be looking at the number of steps it takes to assemble your kayak, and how tricky the steps are. You may find that you have a kayak which is very tricky to put together, but it may also have fewer steps than an easier to assemble kayak. You have to decide if the tradeoff is worth it. 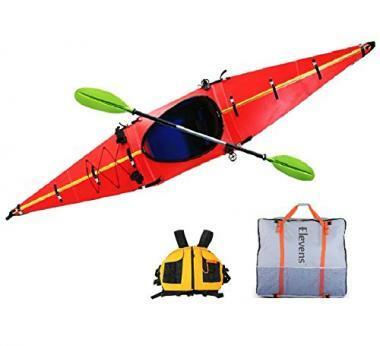 Do you want a kayak which is easy to put together or fast to put together? Of course, if you can get both, then you are onto a winner. Your kayak should be able to last. There is more which can go wrong with a foldable kayak than with a traditional one-piece kayak. There are more moving parts. Some parts bend back and forth. There are fasteners. More moving parts means more chance of something breaking. Your kayak should be strong enough to be moved while folded and not have a chance of breaking. The materials should also hold up to being manipulated into place. The material should also hold up in the water once it has been assembled. Look for a kayak which has some PVC added. This will usually mean a stronger kayak. PVC is good to have, and so is polypropylene. This is an industrial-grade material and will hold up to the assembly, disassembly, and water use. Look for high-quality materials, and always check the reviews. Often people will come back and edit reviews over time. Look for the kayaks which have had no long-term problems and have stood the test of time. One of the reasons you are buying a foldable kayak is probably the reason that it folds up small and can be stored easier than a regular kayak. Foldable kayaks are also easier to transport, and you do not need to have a special rack on your car to transport kayaks. At their smallest, foldable kayaks can be as small as 36 x 18 x 10 inches. When you are thinking about the size, you should not go for the smallest size alone. Check what you have for storage and use that as your maximum measurement, but be flexible if you cannot find the right kayak. Size will make for good storage and transportation, but a smaller kayak may lack the features of a larger kayak. Check the features of each of the kayaks and weight that against the size it compacts down to. Try to find a balance between your storage limitations and the features you want. Another great option if you are worried about transportation is an inflatable kayak. This can be a great option and the inflatable kayak care and repair might not be as difficult as you think but there are some safety tips that you should follow. Folding kayaks are traditionally lighter than one-piece kayaks. This is often another reason why people buy them. When you are transporting a kayak from your vehicle to the water, it can be hard to do by yourself, depending on the weight of the kayak. This can be made a lot easier though by a kayak trailer or a kayak roof rack. Most folding kayaks can be transported comfortably by one person. There are some which are heavier than others, so if you need something which you can carry alone, and you have a long way to go, you should make a choice based on the weight of your foldable kayak. Q: What Is A Folding Kayak? A: A folding kayak is just that, a kayak with folds. If you do not have the storage space for kayak, do not have the means to transport it, or want to travel further afield with a kayak, then a foldable kayak is for you. A foldable kayak is basically a collapsible frame covered with heavy-duty waterproof fabric. The frame is mainly made from wood or aluminum tubes. Some foldable kayaks also use composite materials for the skeleton of the kayak. The rods which usually run from one end to the other are often called stringers. The pieces which go from side to side are known as the ribs. The pieces in the two directions form the frame of the kayak. Aluminum frames are generally lighter and more durable than wooden frames. The benefit of a wooden frame is that they can be assembled faster; they are also easier to repair than aluminum frames. If you are paddling in saltwater, you should try and keep the wooden frame dry as salt water can corrode the wood. The skin of the kayak is made from heavy-duty, tough, and waterproof material. This is often the same material which is used to make inflatable kayaks. The most common materials are nylon, polyester, and synthetic rubber. When you are choosing your foldable kayak, you should look out for high-quality materials. Low-grade materials can be very cheap, but they generally rip and wear more easily. Good material is expensive, but it will last. 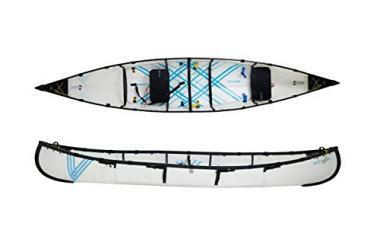 Greenland-type folding kayaks are relatively new to the market and give a light kayak and one which is easier to handle in the water. Older-style kayaks are making way for these newer kayaks, but they still have more of the market share than the Greenland-type, as they have been on the market longer. They are also more affordable. 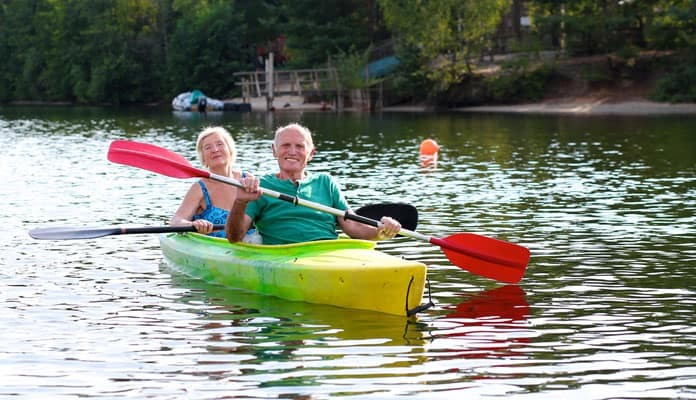 The older kayaks are also better for beginners as they are very hard to capsize in the water. Your last option for a folding kayak is a custom one. You will have to pay more, but you can completely customize the frame, the skin, the paddles, and any kayak accessories. Q: How Do I Store A Folding Kayak? A: There are some great tips for storing a kayak but it comes time to store your folding kayak, there are a few more things to think about than just storing it. Obviously, the main thing you should think about is where you are going to store it. When you bought your kayak, you will have known what your storage options were. Most people will store their folding kayaks in their garage, and most likely on a shelf. When you come to store it, there is one critical factor. Do you have enough room? To store your kayak, you should have enough room for it to sit on the shelf or there are some great kayak storage racks and hoists. If your kayak comes with a storage bag, then disassemble it and place it in the bag. This will keep it protected from any sunlight and dust, etc. You should make sure that you are not placing the bag on any uneven surfaces or placing anything on top of the storage bag. Your other option is to keep the kayak assembled and store it as you would paddle in it. You may only want to dis-assemble the kayak during the winter months and keep it assembled during the hotter months. If you are keeping the kayak assembled, then you should store it with the keel down. You have two main options for storing it this way. You can hang it from the ceiling or place it on a shelf or floor. In both cases, you should have it on a kayak stand or something which will cradle the hull and conform to the hull. You do not want it to fall to the side and sit like that. A stand will keep it from getting damaged. If you are storing it for long periods of time, you should disassemble the kayak first and do some work on it. In fact, you should try and do this every couple of months as regular maintenance on our foldable kayak. Take off the skin and rinse it off, then apply any oil or lubricant as per the manufacturer’s instructions. You should also inspect the frame and apply any lubricant as needed. 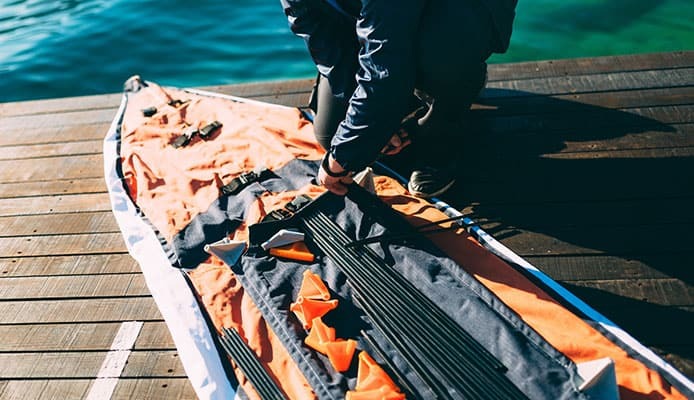 Q: How Do I Pack A Folding Sea Kayak? 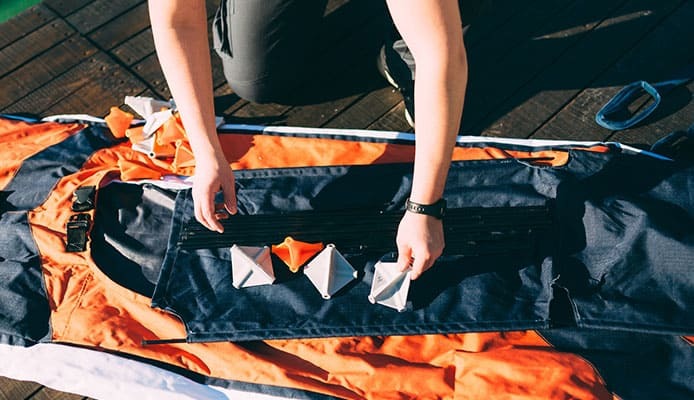 A: Your kayak will come with detailed folding instructions, and the folding process may differ from kayak to kayak, but in essence, the process is pretty similar. We recommend folding and unfolding your kayak a few times after getting it, to make sure that you are familiar with the process before you get to the water. You will want to take the skin off of your kayak by whatever fasteners have been used to attach it. Once you have the skin off, you should be able to fold the skin up nice and compact. The skeleton will fold down next, and if the joints are lubricated, this step will be easy. The first few time you are folding and unfolding, the new material may be harder to fold, but the more you do it, the easier it will get. You may also have a strap which will help you to fold the frame and skin tighter. Once everything is folded, you can fit it into the bag and seal the bag. A foldable kayak could solve a problem which you never one you had. It could also offer you a change to the pace of your life. If you have never been out on the water with a paddle to propel you, then you have no idea what you are missing. 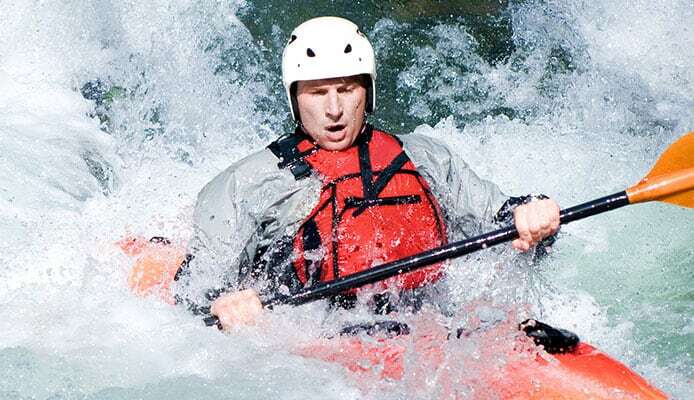 Once you have your kayak then you can think about getting the kayak accessories that you need such as kayak coolers, kayak helmets and a lot more. You also want to make sure you are getting the right kayak paddles for you as well. A foldable kayak is small, lightweight, and performs like a regular kayak. When you buy one, you will be able to store it easily, transport it to the water by hand, and enjoy a life you never even thought about. Take a look at our buying list to gather all the information you need to make an informed choice. Take the time to make a decision based on what you need and what you want.